So, Saturday was the day when the masterpiece blanket finally got to be a very public manifestation of my Diploma in Applied Permaculture Design. 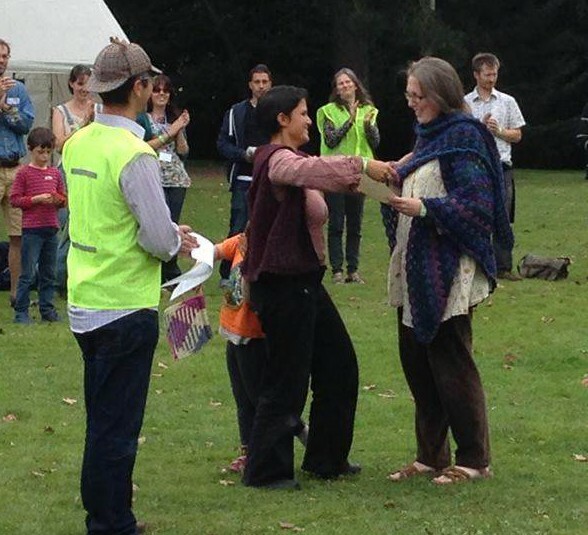 All those squares from across Britain and all over the world were on show at Gilwell Park in Epping Forest, London as I gave my final presentation before receiving my diploma at the UK Permaculture Convergence. Whilst other people choose to use Powerpoint or Prezi on a computer, or have a slide show, I decided to be low tech, but high impact and take my blanket. The main question was how to display it. Especial thanks to all of you out there who contributed… a role of honour to follow later. It seemed to be popular with the audience… and would have worked if there had been a power cut! This is what I like about low tech props, no power cut to stop the show. In the past I’ve used soft toys to represent people and crumpled bits of paper from the waste bin as “Stuff”, the presentation: Distribution of wealth. Appropriate solution, very permaculture of you! Minimal use of resources for maximum impact, and I do love the “I am about to tear my hair out” pose…. I just wish I knew what I was saying! How wonderful to see you so totally enthusiastic and involved in your presentation – I love the photo of you with your arms aloft and head back – pure magic! I’m betting your audience said more than ‘that went well….’ 🙂 The Masterpiece is indeed a masterpiece! I am sorry that I was not following you sooner and could take part. Congratulations and well done Ms Snail – a mighty, mighty accomplishment. Thank you. One of the people there suggested that I should have a ‘cushion of late-comers’ for those who missed out first time round! Oh, I’m in! Just give me the parameters etc – size? colour preference? Type of yarn? Congratulations, not that there was ever any doubt it would be well received or that you’d make an excellent presentation. Back home to the chickens now I suspect but I hope you still feel the thrill of the day. You should be very proud of yourself. Thank you David. Yes I am back with the chickens and dogs once again… I couldn’t stand that much excitement too often! Congratulations and very well done to you! Thank you…I was wondering what to do next, but it turns out that lots of people are asking me either to write things for them or make things, so I’m not at a loose end!! Ditto with Ms Pauline, I arrived to late on the scene to take part but maybe we can just make another one…this time for your masters? 😉 Seriously though it looks absolutely lovely and you look like you are certainly animated in your enthusiasm with both hands raised aloft like they should be holding Excalibur (or the sword of Damocles 😉 ). Big congratulations on your success at finishing and what are you going to do next? Thank you… I’m running out of qualifications to collect… I have a BSc, MEd and PhD (yes, I’m really Dr Snail) already, as well as O-levels, A-levels, a half-mile swimming certificate and my Gold Upland Navigation award!! The next creation will mark the love and generosity of my friends I think!! Thank you! It was fun, but I’m quite glad to have finished my studies for the time being. Many thanks… I couldn’t have made it without so many lovely people who made parts of it… beauty in diversity! As someone said, ‘very permaculture’, I agree! Every principle and ethic is right in there! Oh Congratulations! You did it! And you did it so well! The Master piece is stunning! A real labour of love. I am so pleased for you and proud of you! Thank you, Karen… I’m very happy! Congratulations! 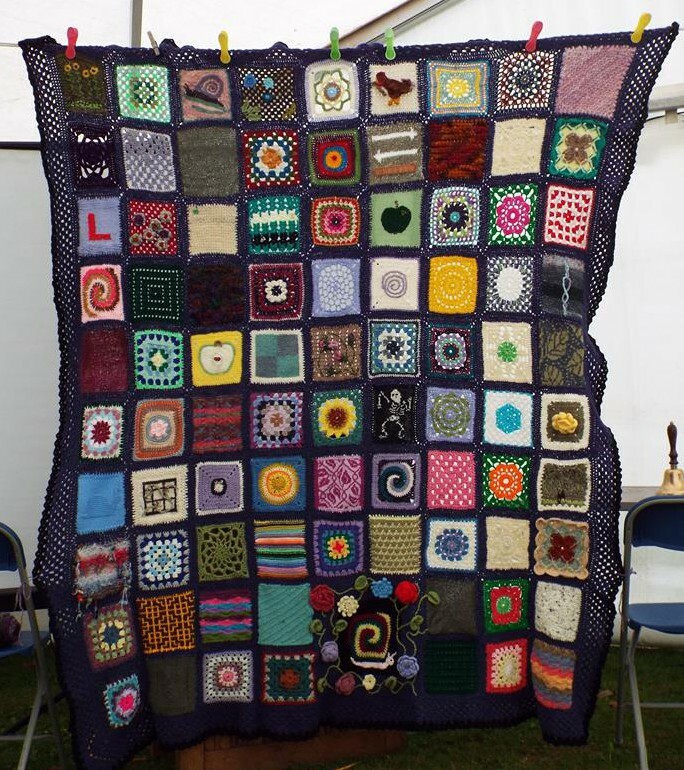 It was lovely to meet you and a privilege to see your presentation and gorgeous blanket. I *love* the idea of a ‘cushion of latecomers’! Well, I’d better get that one sorted then! It was lovely to meet you too. I really did enjoy myself… other people get stressed about public speaking, but I love it! This turned out great–just wonderful! I love the photos of you doing the presentation–I’m a former teacher of public speaking and I do love seeing a speaker get excited about her topic! Thank you Katy… another week of mad rushing about and then I might get a chance to call round again! what we can achieve when we work together. Thank you…it did come together really well!